So my DH and I went to the American Craft Council show in St Paul on Sunday. There we met Chickie and Chickie Mama and began wandering up and down the aisles. We spent almost four hours there, walking, looking and enjoying. Although I was looking for a new pair of earrings, I didn't end up with anything at all. On the way out of the center, we crossed the street at the crosswalk heading back to the parking garage. That's where things went wrong. The curb was exceptionally high, my shoe caught the top and I went sprawling directly into the metal base of the stoplight with my head. Fortunately I bounce. My glasses saved my nose from being broken, and they even survived. I am a bit sore this morning, but OK. My DH was very shaken up by it, though. I'm starting out with the glasswork of Richard M Parrish. Amazing stuff that stopped me dead in my tracks for a long time. 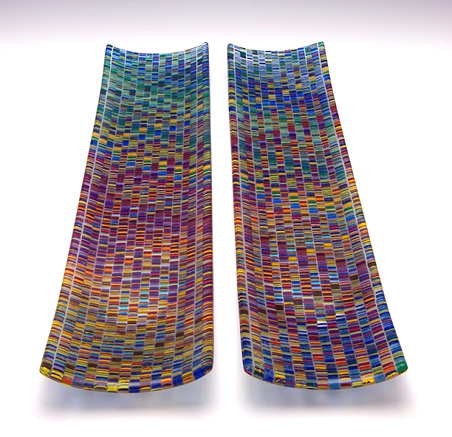 His understanding of the media of glass, the transmission of light, and how colors work together allows his amazing pieces of fused glass to look like woven paper. But they aren't. The skill level that these simple pieces represent is top-notch and apparently is recognized throughout the world because he teaches throughout the world. I'd love to take a class from him and get some of his knowledge. Just looking at his pieces was a treat. Check out his website at Fusio Studio. Carol and Jean-Pierre Hsu specialize in playful jewelry and mobiles featuring anodized aluminum. Colorful and bold, this pin is a small piece in a large offering. Take a look a their website. Every year I fall in love anew with the large glass sculptures of Dan Neil Barnes. 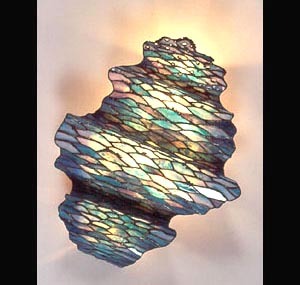 Such wonderful work with color and light - he does architectural glass as well as odd pieces. Sculptures and vessels are most of what he brings to the shows, but don't miss his windows and custom doors on his website. He also does restorations if anyone needs such work. 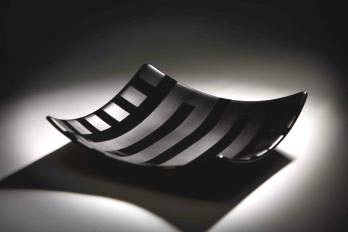 Nate Evans produces simple and elegant glassware with absolute precision and a wonderful contrast in finishes. He forms the glassware and then sandblasts select areas making geometric patterning that enhances the glass. His studio is in Iowa, so fairly close to me. It's tempting to take a field trip, but time isn't in my favor. Take a look at Red Hawk Glassworks. The final offering for you is Sheryl Tuorila who is doing some of the nicest fine art tilework I've seen in a long time. She is a local artist for me, with studio space in the Northrup King building. The piece I've chosen to show you is a wall splash made for behind a stove or a sink. 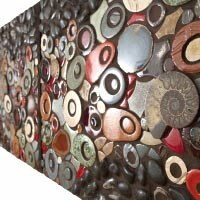 But she makes a large variety of art tiles in many different shapes and sizes. I know you'll enjoy seeing her work at sheryltuorila.com. Current Location: Chiro this morning - need it!